This washer was our washer of choice for an upgrade to a front loader washer with 7.1 cubic feet of space it isn't the largest option available from Amana but it is perfect for a family with teenagers and toddlers. This washer was purchased only a few months ago and the difference in the washing ability is great. The dryer does not lack different available washing functions it also has the digital read so that you can see how much time was left. 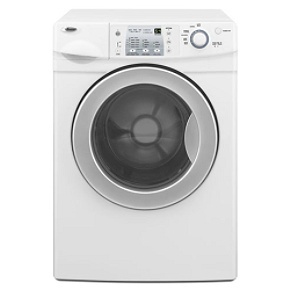 This washer is much quieter than the older style washers which is great if the washer is located near bedrooms or high traffic areas where you don't want to hear the loud vibrating and shaking all day or night long. One of the energy saving features of this dryer is the automatic water level detector. No longer do I have to stand there and attempt to figure out how much water I need. The front loader uses much less water than the old style top loaders that had to fill up in order to wash laundry. One downside to the washer is the installer told us that to keep the seal on the door from having problems it is best to keep the door slightly open after washing laundry. This may not be a big deal but if you have a small space for your washer and dryer that may not be possible. Overall the comparison between the Amana brand and some of the more well known brands is equal. If you are looking for the new front loader style and new functions Amana may be the way to go. You need to leave the door FULLY open and fully dry the door boot seal (big gasket between drum and frame). I now stuff rags in and under seal to let air in. Water sits in and under it, it does not fully drain out. I learned too late, now have mold. will have to remove seal to properly clean seal and drum. Will NEVER buy a front loader again.